Screen shot shows outputs of LASERDYNE Process Calculator. The calculator helps laser users more efficiently develop new processes and better understand the likely impact of change made to existing processes. The new Process Calculator from Prima Power Laserdyne allows process engineers and operators of LASERDYNE systems to more efficiently develop new processes as well as better understand the likely impact of change made to existing processes. The goal of the Calculator is to minimize time on the machine to create a process. For laser drilling this means minimizing the time to produce the correct size and quality of holes. With starting values for pulse energy and peak power, users of the LASERDYNE Process Calculator are able to determine the optics configuration that will give the correct hole diameter and peak power density. Calculations are similar for development of laser cutting and welding processes though the range of parameters can be quite different based on the application requirements. For example, in some cutting applications such as trimming formed 3D parts, the main goal is speed (cycle time). In other applications, such as cutting vane slots in stator rings, the main goal is edge finish with a high level of precision. With the LASERDYNE Process Calculator, these requirements can be quickly and accurately converted into laser process parameters. 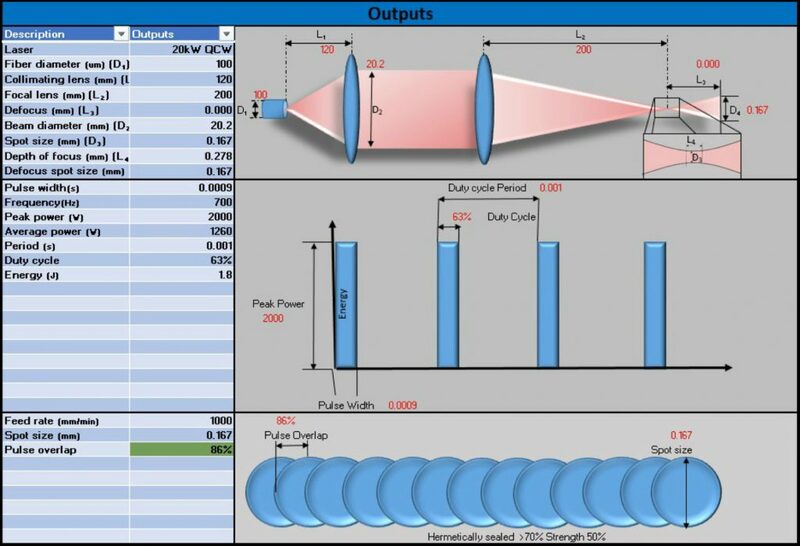 Using the LASERDYNE Process Calculator, process engineers will define a set of laser and process parameters “to get into the ballpark” with their process before setting up on the laser machine to finish developing a new process. Both process planning time and machine time is thereby saved. Parameters for 2-4 kW CW fiber lasers and 3-20 kW QCW fiber lasers are available options in the Calculator menu. The LASERDYNE Process Calculator, which runs in Microsoft Excel, is available free of charge to users of LASERDYNE systems. Prima Power Laserdyne announced that its upcoming Advanced Training Class will include a session on use of the Process Calculator. The company is also scheduling webinars for training LASERDYNE users about how to best make use of the Process Calculator.